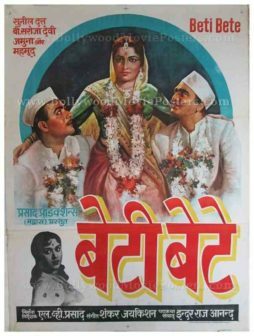 Bollywood poster for sale of the old Hindi film, Naya Daur (1957). 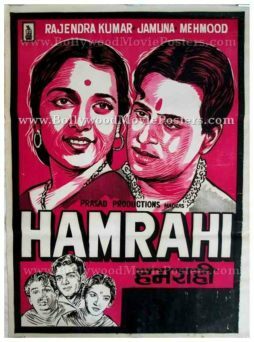 This is an actual surviving Bollywood poster for sale of the 1957 cult Hindi film that was directed by B. R. Chopra starring Dilip Kumar and Vyjayanthimala in lead roles. 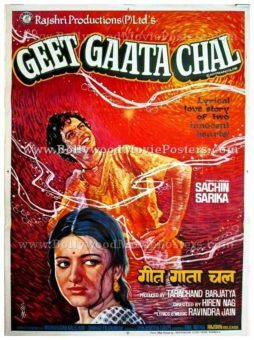 This vintage Bollywood poster was designed and printed for publicity of the film several years after its original release (somewhere in the 1970s) but never ended up being used. Upon its original black and white release in 1957, Naya Daur was a tremendous success at the box office and became the second highest grossing film of 1957 behind the critically acclaimed Mother India. Naya Daur's massive success and cult following over the years prompted an effort to colorize the film. It was colorized and re-released in 2007. Songs from the film became a rage throughout the country, instilling national pride in people's minds. The song, “Yeh Desh Hai Veer Jawanon Ka” sung by Mohammed Rafi is regarded as an all time classic and is fondly remembered and played till today. Another song, “Saathi Haath Badhana” sung by Mohammed Rafi went on to become a chart topper as well. 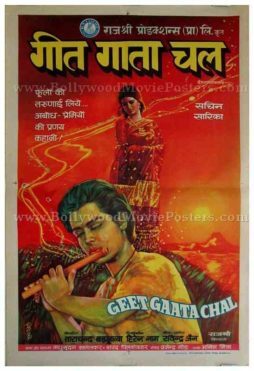 This Bollywood poster for sale was originally designed in hand painted oil on canvas format by a small time art studio. 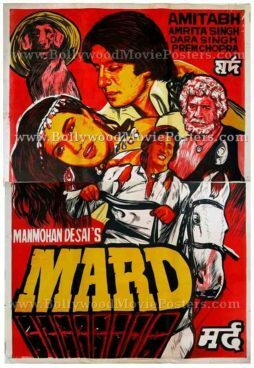 Lead actor Dilip Kumar is seen prominently on the top carrying a pick axe in a hand painted avatar. 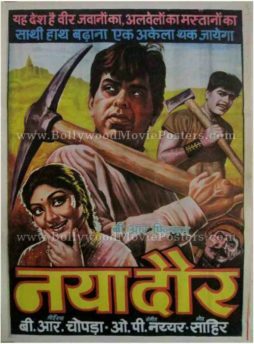 Supporting actor Ajit is seen in the background of this Bollywood poster for sale holding an axe. Smaller hand painted portraits of a smiling Vyjayanthimala and the antagonist Jeevan are seen at the bottom. 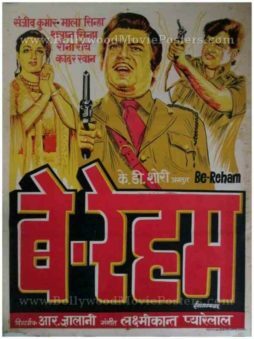 This Bollywood poster for sale capitalizes on the massive appeal of the two hit songs from the film, “Yeh Desh Hai Veer Jawanon Ka” and “Saathi Haath Badhana” by announcing their lyrics on the top. Naya Daur was involved in a highly controversial and widely publicized court case during its production. Initially, actress Madhubala was cast as the female lead and had been given an advance payment for the role. She was later sued by B. R. Chopra for the advance received as her apprehensions of traveling to outdoor locations where the film was to be shot had stalled the film. B.R. Chopra replaced Madhubala with actress Vyjayanthimala and the film went on to become a tremendous success. 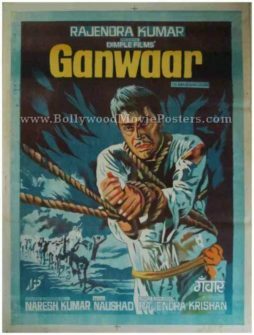 Re-release Bollywood movie poster of the blockbuster Hindi film, Laawaris (1981) for sale. 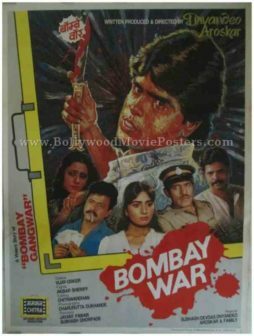 This is an actual publicity poster of the 1981 film that featured the greatest superstar of Indian cinema, Amitabh Bachchan in the lead role. 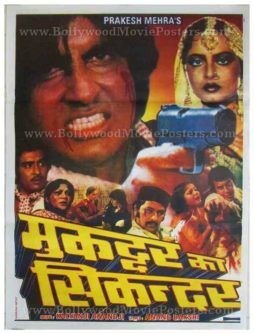 Re-release Bollywood poster of the blockbuster Hindi film, Muqaddar Ka Sikandar (1978) for sale. 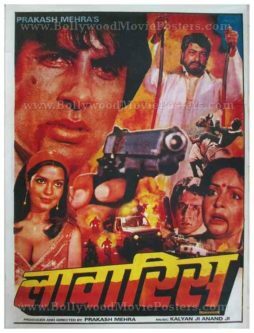 This is an actual publicity Bollywood poster of the 1978 film that featured the greatest superstar of Indian cinema, Amitabh Bachchan in the lead role. 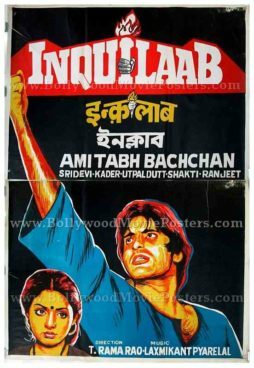 Printed and circulated decades after the first release of the film (somewhere in the early 2000s), this Amitabh movie poster was originally designed for publicity of the recent re-release of the film but never ended up being used. 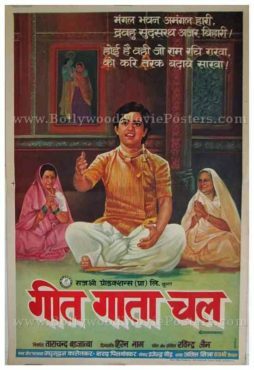 Muqaddar Ka Sikandar (Conqueror of Destiny) is a 1978 blockbuster Hindi film produced and directed by Prakash Mehra. 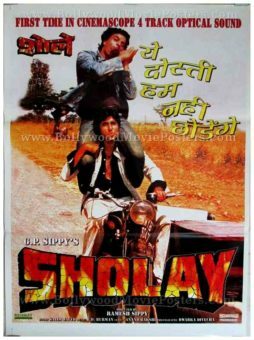 Starring superstar Amitabh Bachchan in his fifth of nine films with Prakash Mehra, this was the top grossing film of the year and the third biggest hit of the decade after Sholay and Bobby. 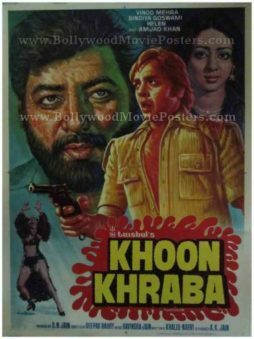 The films also stars Vinod Khanna, Raakhee, Rekha and Amjad Khan. The film is believed to have created mass hype during its release – with people lining up for tickets (some even sleeping outside cinemas overnight). 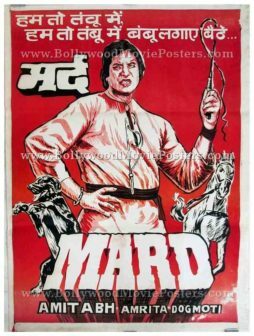 True to Amitabh Bachchan’s super stardom, Muqaddar Ka Sikandar broke several box office records and became a golden jubilee hit. 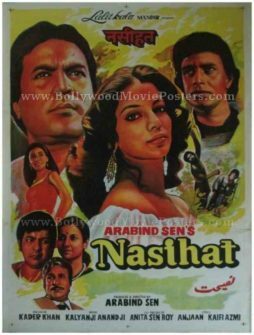 It was remade into a Telugu film in 1980. Similar to a few of his other films, Amitabh Bachchan plays the role of an orphan in Muqaddar Ka Sikandar. 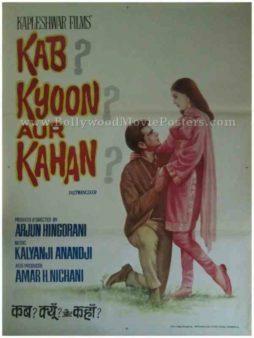 The Soundtrack was composed by brothers Kalyanji Anandji, and the songs went on to become blockbusters. Tracks like “Rote Hue Ate Hain Sab” and “O Saathi Re Tere Bina” sung by Kishore Kumar are played till today. The songs “Dil To Hai Dil” sung by Lata Mangeshkar and picturized on Raakhee became a rage as did “Salaam-e-Ishq Meri Jaan” sung by Lata Mangeshkar and picturized on Rekha.